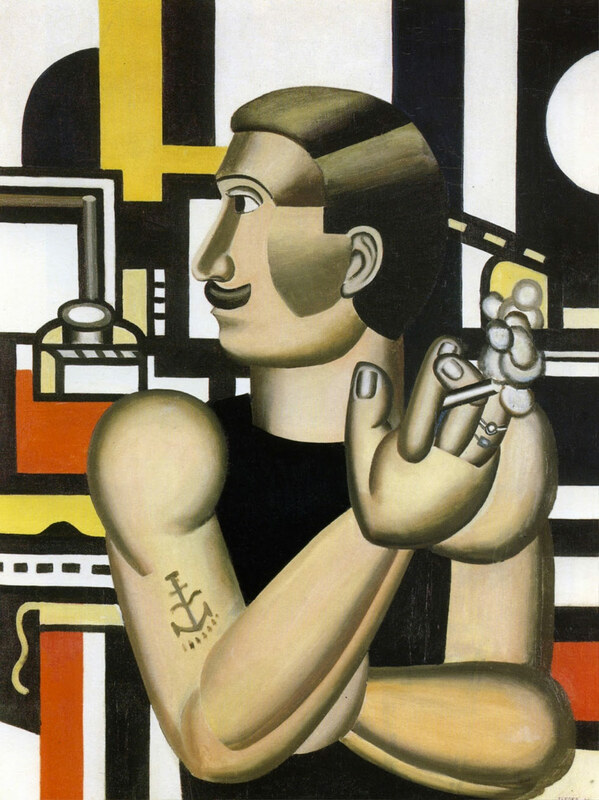 Joseph, Fernand Henri Léger was born on February 4th, 1881 in Argentan (Orne). His father, a cattle dealer, dies in 1884. An only son, he is raised by his mother, Marie-Adèle Daunou, a self-effacing and pious woman. If my father had lived a few years longer, I would have become a cattle dealer like him. No doubt. I was strong, I loved going to the field to see the oxen. It’s amazing, the life of great farmers… I spent my whole childhood in Normandy, it gave me solid, rough foundations. Interview with D. Vallier, Intérieur de l’art. 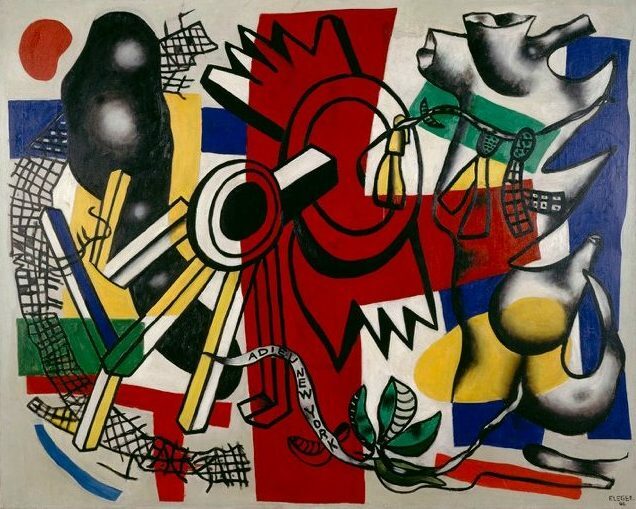 Fernand Léger willingly admits he was not a studious pupil and was only interested in drawing and gymnastics! That explains why, after a stint at the Collège d’Argentan (Collège de Mezeray), his mother sends him to Tinchebray, a religious boarding school. He attends alongside Andre Mare and Henri Viel his first drawing lessons at M. Corbin’s, a local decorator. Against his family’s wishes, he begins an architecture apprenticeship, working first in Argentan, then with an architect in Caen for two years. In 1900, he goes to Paris to join his former Argentan classmates before doing his military service in the 2nd Engineer Regiment in Versailles until 1903. After a hint of tuberculosis, he visits his friend Henri Viel in Belgodère, Corsica, during the winter of 1906 and 1907, and again in 1908 at the Château Piccioni, in l’Île-Rousse. Receptive to the Mediterranean light, he paints landscapes, five of which are presented in October of 1907 at the Salon d’automne, where he discovers the work of Paul Cézanne. His influence is decisive and he follows in his footsteps by working on volumes. 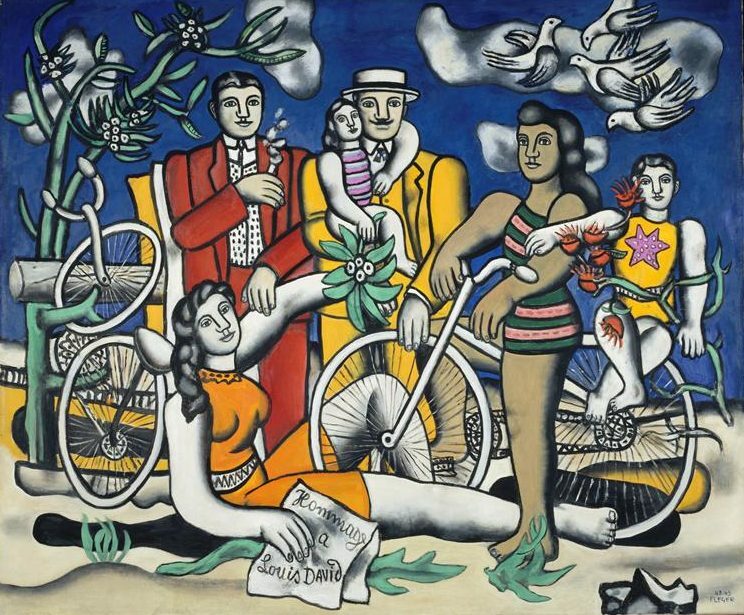 Little is known about his impressionist period, because Léger destroyed all his artworks in 1909. All that is left are the gifts he gave to friends. 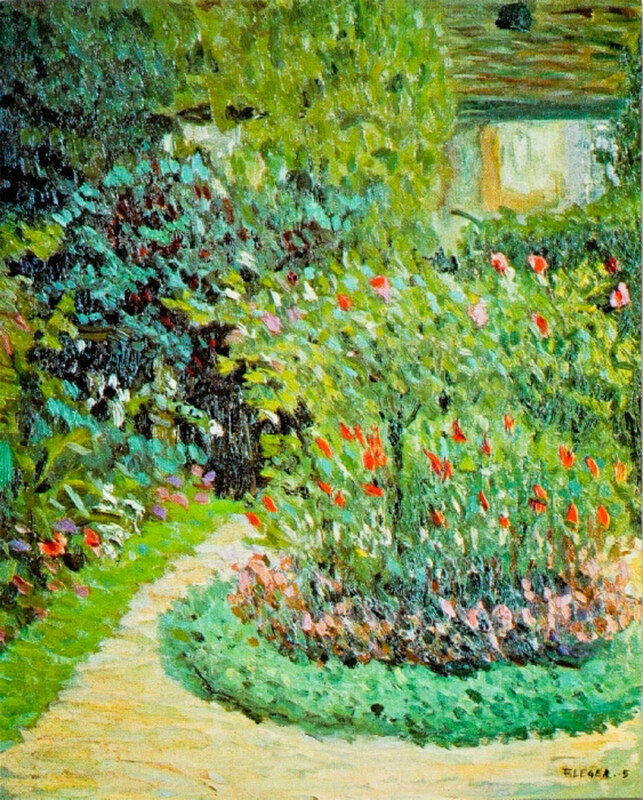 His first paintings are marked by impressionism, Le Jardin de ma mère, 1905, and Le Portrait de l’oncle, 1905 (Musée national Fernand Léger, Biot). In October, he shares a studio with André Mare. My first paintings were done in the impressionist genre, right after that I had a reaction against impressionism… and I had that reaction because I felt that the impressionist period had been naturally harmonious while mine was no longer so. In 1909, he rents a studio in La Ruche and frequents Alexandre Archipenko, Henri Laurens, Jacques Lipchitz, Chaïm Soutine, Robert Delaunay, Chagall, and the writers Guillaume Apollinaire, Max Jacob, Maurice Raynal and Blaise Cendrars. He also meets the painter Henri Rousseau. 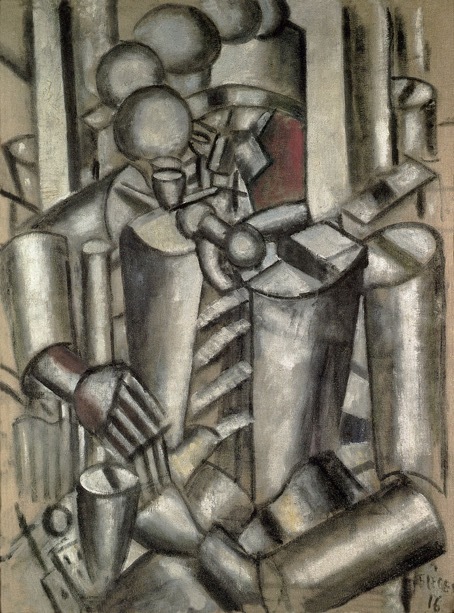 Fernand Léger diligently visits modern art galleries. One in particular piques his interest: Daniel Henri Kahnweiler’s gallery, which exhibits Braque and Picasso. Inspired by the landscapes of Braque, Léger thus joins the cubist movement. 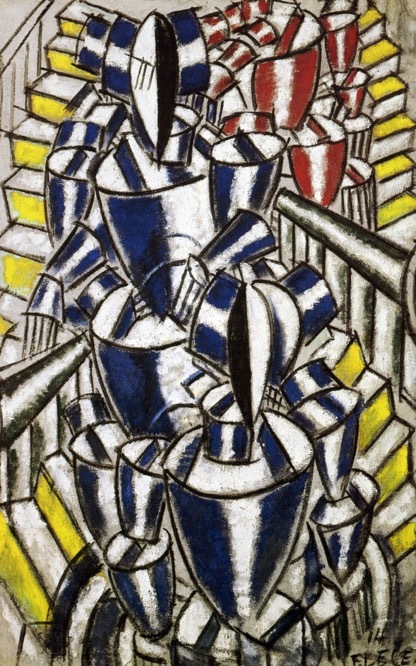 With La Coueuse, 1910, a portrait of his mother, Léger tries to follow Cézanne’s teachings that argue nature is entirely made up of cubes, cones and cylinders, but he adds to it his own research on movement. He reintroduces colors, in swathes, in contrast with shapes and volumes constructed and shaped with light in neutral tones. In 1910-1911, he paints La Noce. 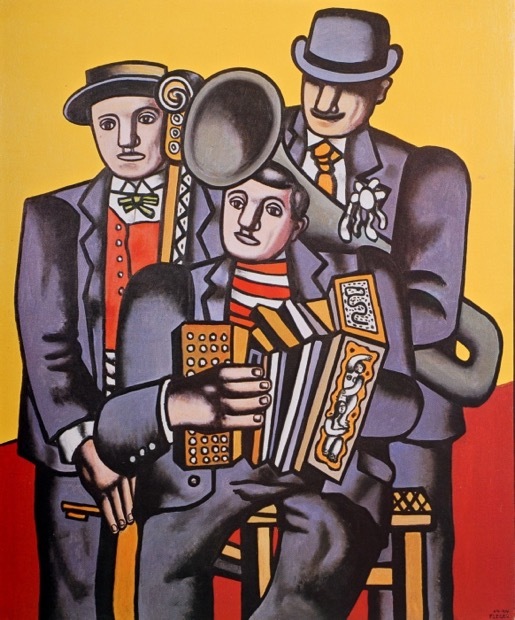 In 1911, at the age of thirty, after many months of work, he exhibits his first major work, Nus dans la forêt, at the Salon des indépendants, where Louis Vauxcelles harshly calls him a “tubist”. The year 1912 is marked by numerous exhibitions. Robert Delaunay, Albert Gleizes, Jean Metzinger, Henri Le Fauconnier, Raymond Duchamp and him meet up at Jacques Villon’s studio for meetings that give birth to the Section d’or, where he presents La femme en Bleu, a painting he will also exhibit at the Salon d’automne. 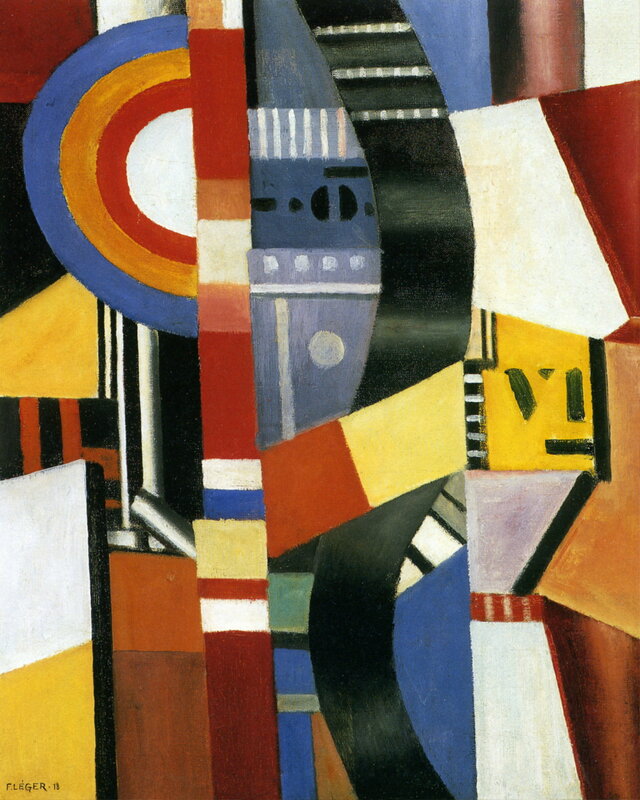 In the paintings from this period (1911/1912), style and content blend into one another and objects are hardly recognizable: Léger continues his formal research, but with increasingly abstract compositions. 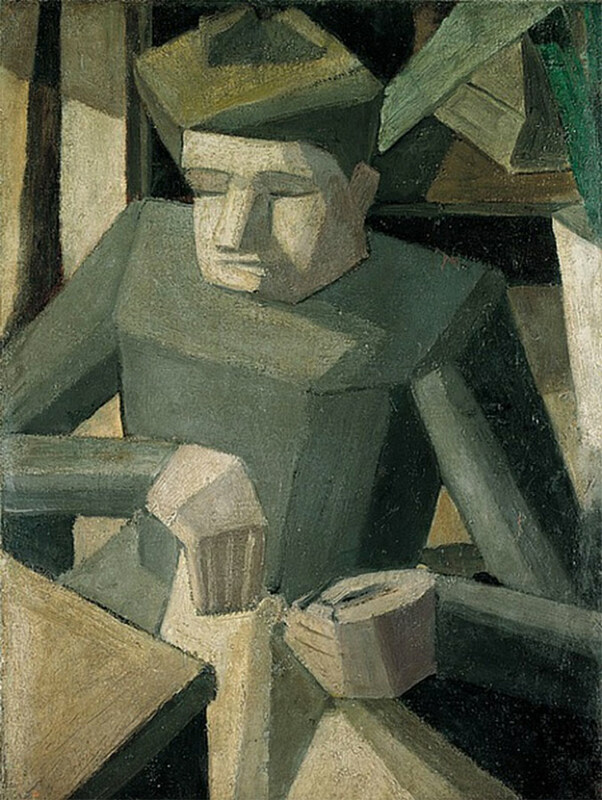 His painting Le Passage à niveau decorates the Salon bourgeois of the Maison cubiste, designed by André Mare and Raymond Duchamp-Villon. He meets André Salmon and Jules Romains, then Jeanne Lohy, whom he marries in 1919. Contrast has always frightened peaceful and satisfied people, who adore the state of peacefulness, in the negative sense. 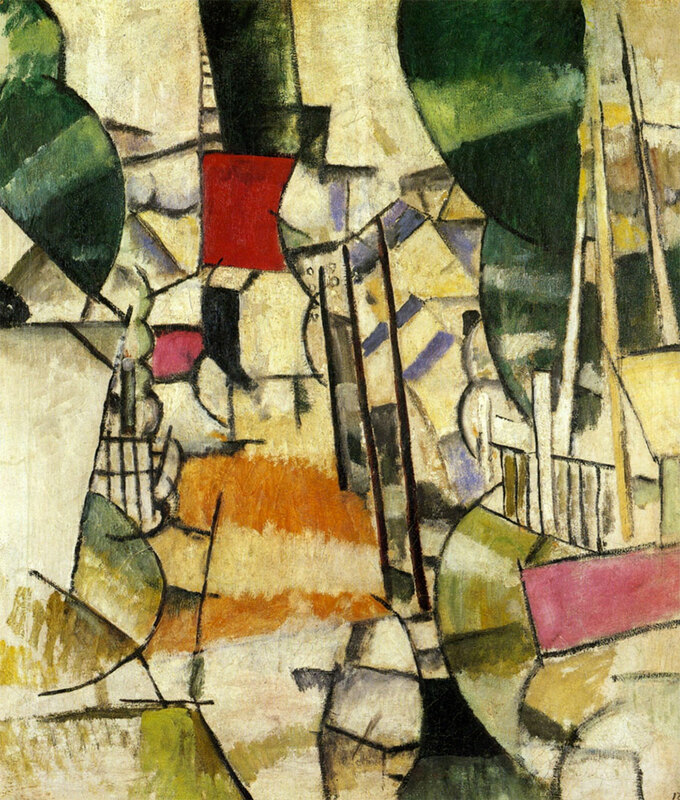 In 1913, he participates in the Armory Show exhibitions organized by the American Association of Painters and Sculptors, in New York, Chicago, and Boston, and regularly exhibits at the Salon des indépendants. On May 5th, in Paris, he holds his first lecture at the Académie Vassilieff: The Origin of Painting and its Representative Value, marking the beginnings of his teaching career. In October, he signs an exclusive agreement with Daniel-Henry Kahnweiler, then takes over the studio of the painter Henri Le Fauconnier, at 86 rue Notre-Dame-des-Champs in Paris, where he will stay until his deathhis death. This period was often compared to Marinetti’s futurism. 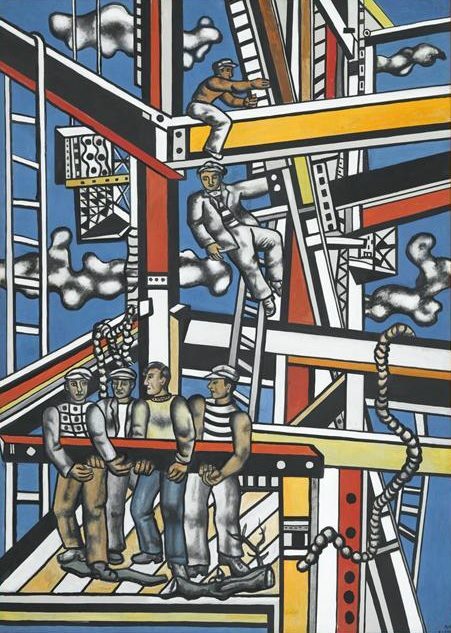 Indeed, Léger was interested in translating the modern world in his paintings, with his research on dynamic effects. Whereas he is fascinated with the acceleration modern life is experiencing, his formal research lacks the political dimension of the futurists, who are anarchists. 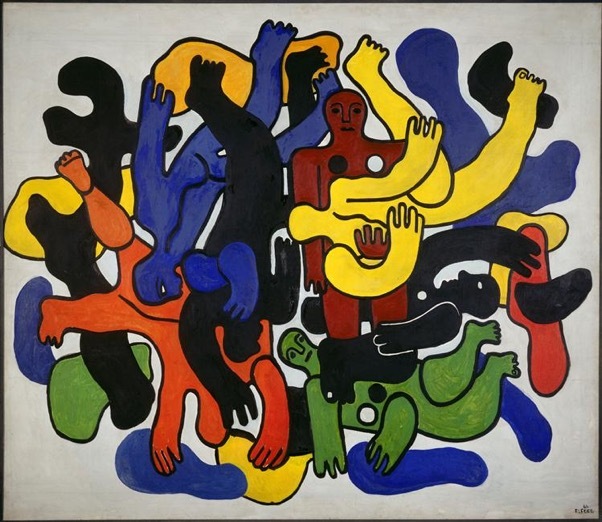 Fernand Léger seeks with his contrasts of shapes and colors to establish formal oppositions between lines, surfaces, and colors. He creates for the viewer a dynamic effect, as close as possible to the feelings that modern life elicits in him. On May 9th, 1914, he holds his second lecture at the Académie Vassilieff, “Current Pictorial Realizations.” He becomes friends with Michel Larionov and Natalia Goncharova. 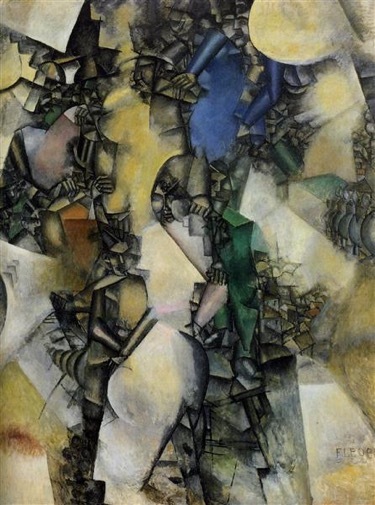 Fernand Léger is mobilized on August 2nd, 1914 and joins the 2nd Engineer Regiment in Versailles. After the First Battle of the Marne, he becomes a stretcher-bearer on the Argonne war front, where he will spend a total of three years. Due to the circumstances, he can only express his art by drawing on ammunition boxes, military maps, or stationery. Throughout the war, he paints two masterpieces, Le soldat à la pipe (1916) and La partie de cartes (1917) during furloughs. In September of 1916, he almost dies from a mustard gas attack in Verdun. 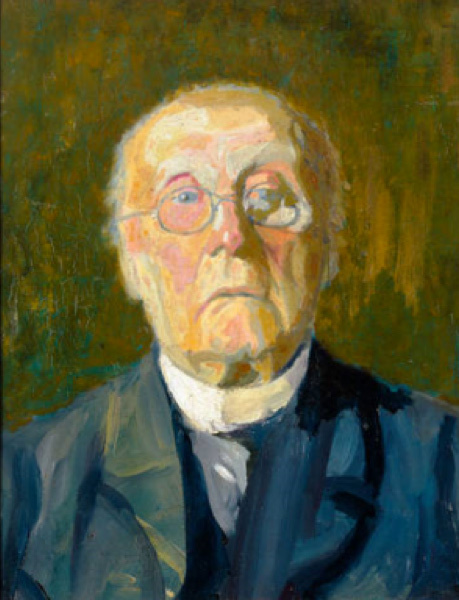 Mentally and physically exhausted, he is hospitalized and reformed in 1917. During his convalescence, he paints La Partie de cartes (Otterlo, Rijksmuseum Kröller-Müller). 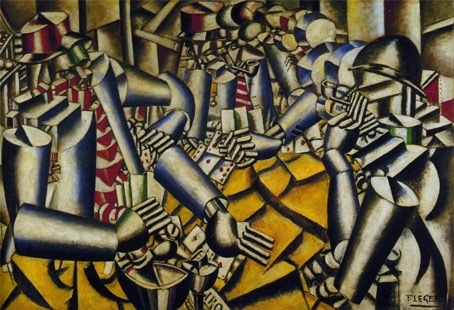 While wartime experience leads to a new social consciousness for the artist, it also elicits a major revelation in him: machines, symbols of modern human knowledge, become aesthetic objects as any other work of art. I was dazzled by a 75 barrel, opened in bright sunlight, the magic of the light reflecting on white metal. That was all it took to make me forget the abstract art of 1912-1913. Total revolution as a man and as a painter. After his recovery and subsequent return, he lives with Jeanne Lohy in Vernon (Normandy). They marry in 1919. He meets Picasso and Cendrars at the banquet held in honor of Braque, at Marie Vassiliev’s. He then takes part in the first “Montjoie!” festival, organized to celebrate the return of artists from the war. In 1918, he signs a new agreement with Léonce Rosenberg, owner of the Galerie de l’Effort Moderne. Mechanical elements captivate him. To translate modern life, he incorporates into his landscapes advertising posters, fragments of architecture, and scaffoldings. He paints the series Disques (City of Paris Museum of Modern Art) and La Ville (Philadelphia Museum of Art), which will be exhibited at the Salon des Indépendants of the Grand Palais in 1920. 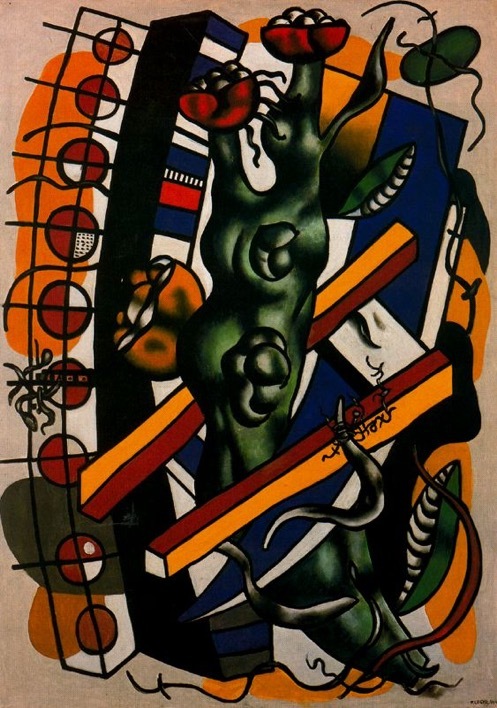 In February of 1919, Fernand Léger has his first solo exhibition at the Galerie de l’Effort Moderne, where Blaise Cendrars and Erik Satie perform a poetic and musical matinee. He does a series of paintings inspired by barges and tugboats seen from the Seine in Vernon. He actively participates in a group of artists from the Section d’or and prepares the exhibition that will take place in March of 1920. Fondation of the “Académie Moderne” with Emile Othon Friesz. His newfound awareness of the intrinsic beauty of industrial objects largely explains the amalgamation of human bodies and machines in Le Mécanicien, painted in 1920, a modern hybrid that translates an optimistic vision of technical progress, the promise of a better life. 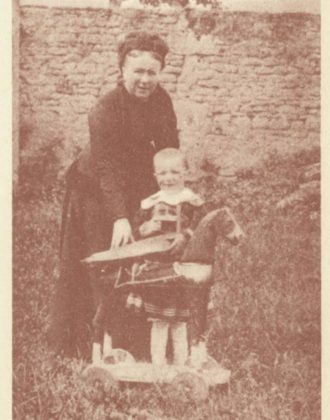 After his mother’s death on April 6th, 1922, he inherits the family farm in Lisores (Calvados) where Jeanne and him will spend their summers. 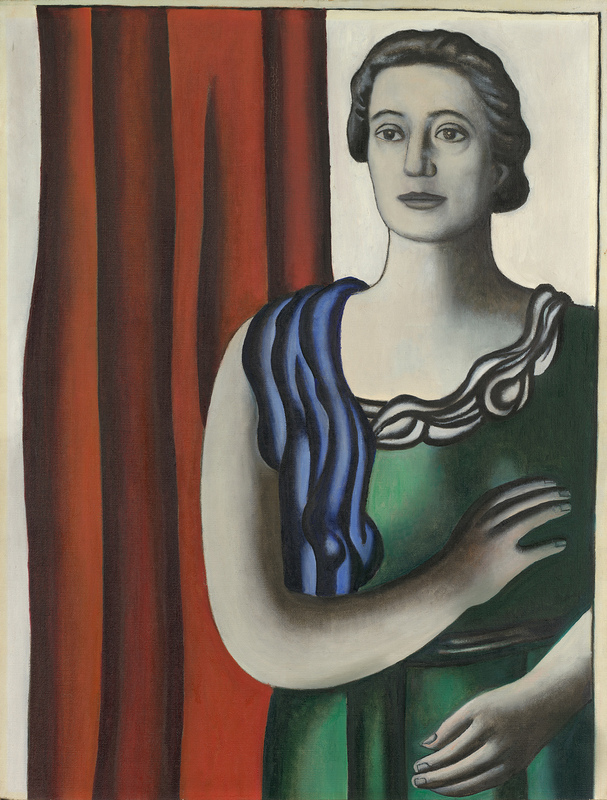 Fernand Léger, who was in between contracts from 1922 to 1924, later renews his agreement with Léonce Rosenberg. He becomes the main artist of the Galerie de l’Effort Moderne. Between 1920 and 1925, cinema and ballet inspire his motion paintings. The Ballets suédois of the choreographer Jean Börlin, who have been at the Théâtre des Champs-Élysées for two years, perform Skating-Rink (costumes by Fernand Léger) on January 20th, 1922, and Création du monde in 1923 (set and costumes Fernand Léger). At the end of the year, Léger shoots with Dudley Murphy and Man Ray the first images of his Ballet mécanique, his first film without a script, for which Kiki de Montparnasse (Alice Prin, known as Kiki de Montparnasse, muse and companion of Man Ray) lends her face. The first screening takes place in Vienna during the inauguration of the international Ausstellung Neuer Theatertechnik. In 1924, Amédée Ozenfant joined Fernand Léger at the “Académie moderne” at 86 Notre-Dame-Des-Champs in the Montparnasse district, thus marking it its true start. Marie-Laurencin, also part of the Section d’or, has been there from the start. 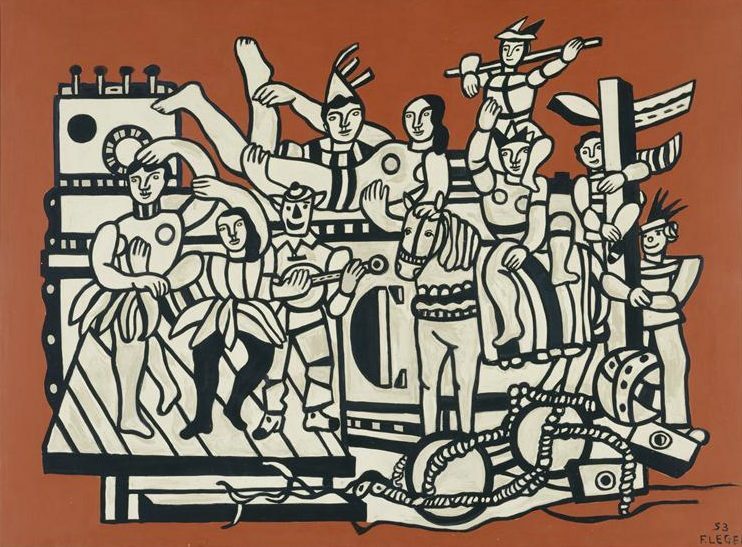 In 1925, Le Corbusier invites Braque, Picasso, Gris, Ozenfant and Léger to decorate his Pavillon de l’Esprit nouveau with paintings. To disseminate his modernist ideas, Léger collaborates on the magazine L’Esprit nouveau and gives lectures at the Sorbonne and the Collège de France. In November of 1925, his first solo exhibition at the Anderson Galleries in New York is a success, and in 1926, his costume designs for the Ballets suédois’ Skating-ring and Création du monde become a reference during the Exposition internationale des arts du théâtre. 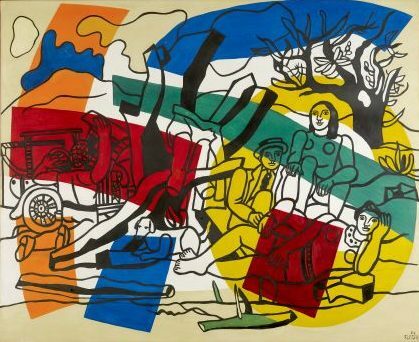 Raoul La Roche, an important collector, acquires paintings from Léger to decorate his Le Corbusier villa in Auteuil. Fans such as Alphonse Kahn, the Baron Gourgaud, and the Vicomte de Léché also buy some of his work. Nadia takes control of the studio and has an imperceptible, but extremely real influence that can be detected in the key compositions (objects in space) as well as in La Joconde aux clés, a suprematist and surreal synthesis, exhibited at Paul Rosenberg’s gallery in 1930. 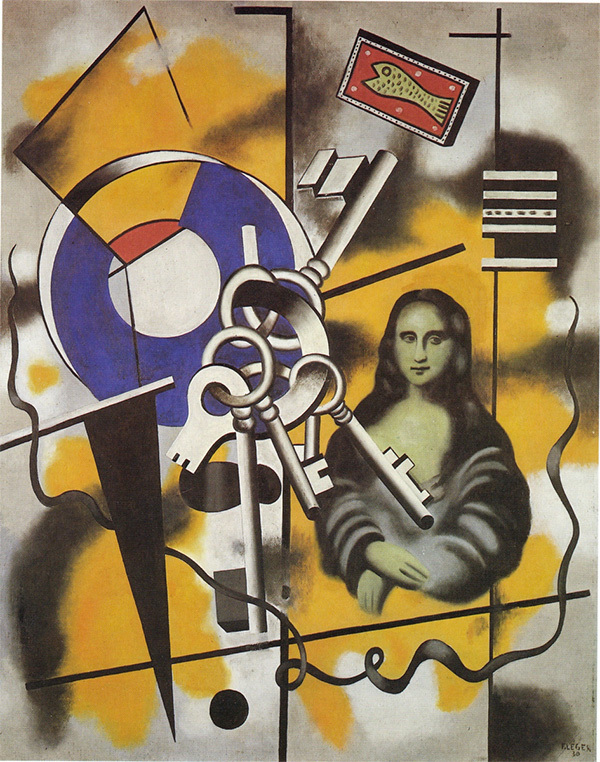 One day I had painted a set of keys on a canvas. I did not know what to put next to it. I needed something that was the absolute contrary of the keys. So when I was done working, I went out. I had barely walked a few steps, and what did I see in a shop window? A postcard of the Mona Lisa. I immediately knew she was what I needed. What could have contrasted more with the keys? At fifty years old, Léger decides to travel to the United States for the first time (he will go there three times in the 30s) for an exhibition of drawings at John Becker’s gallery in New York, where he meets an old acquaintance, Marcel Duchamp. It is also an opportunity for him to meet new collectors. He participates in numerous lectures underlining the connection between painting and architecture. 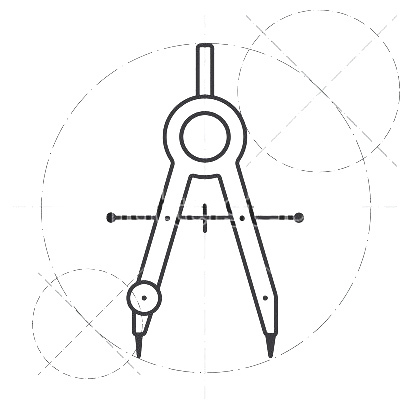 He collaborates with famous architects, such as Harvey W. Corbett, Buckminster Fuller, John Storrs, Paul Nelson, Wallace K. Harrison, and Mallet-Stevens. He also does interior design with his friend Charlotte Perriand. In 1938, he paints abstract wall decorations in N. Rockefeller’s apartment. Painting is a sister to architecture. That is the contribution. 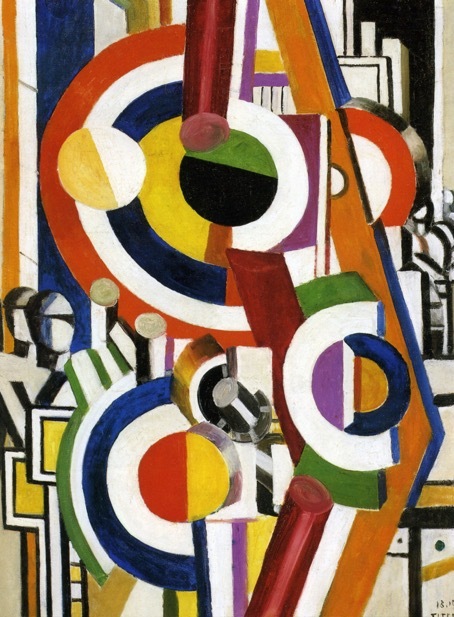 The connection is such, so imperative that Fernand Léger, of all painters working today, is one whose paintings require a new architecture. One whose paintings require a period frame, conforming and of equal birth. During that time, Léger regularly visits his Lisores farm, in Normandy, to relax and take long walks in the forest of Fontainebleau with Simone. He picks up flints, sticks, nuts and holly leaves, which inspire him to produce biomorphic and realistic drawings. 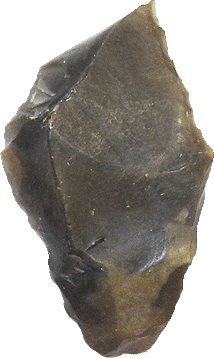 These natural objects, or even used objects, will come to dethrone industrial objects in his compositions. Machines no longer seem to him a source of progress, but rather a means to enslave man. 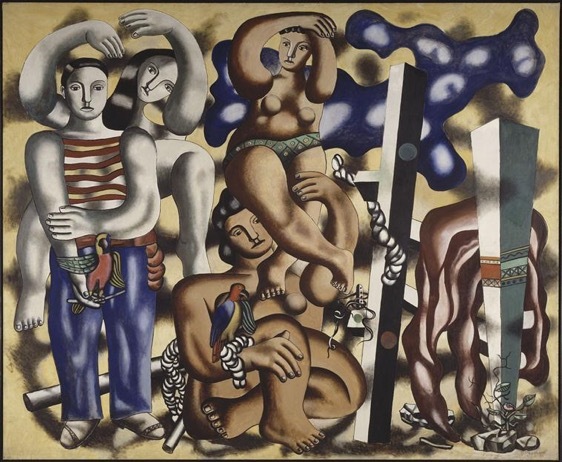 Léger, wishing to see humankind reconnecting with nature, creates large compositions that are a utopian vision of a return to harmony between nature and man. The 1930s is also the decade of the Great Depression. The Galerie de l’Effort Moderne goes bankrupt, and Fernand now exhibits for Leonce Rosenberg’s brother, Paul, who has a much more pragmatic conception of the profession of gallery owner. 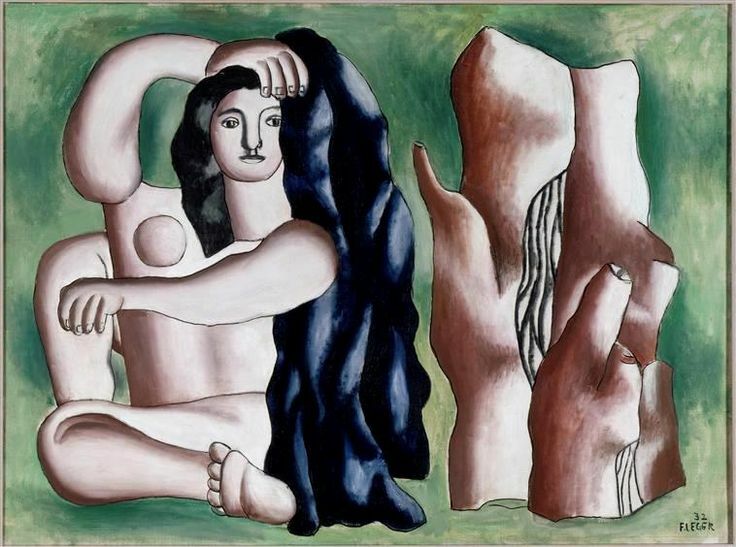 Léger, still exhibiting large compositions at salons, lives off of his art. He sells directly to collectors who visit him in his studio. But he also becomes known internationally and many retrospective exhibitions are organized in Europe and the United States. He also meets Simone Herman around that time, and the two he will have an affair and a correspondence of over two hundred letters, an important source of information for art historians today. A crazy speed drives the world and creates a whirlwind where thousands of butterfly individuals will be drowned without hope… Remember that the great natural functions must nevertheless be our barometer. These concerns also have a political outreach. 1936: year of the Popular Front and paid holidays. A large number of workers find their way back to the countryside. 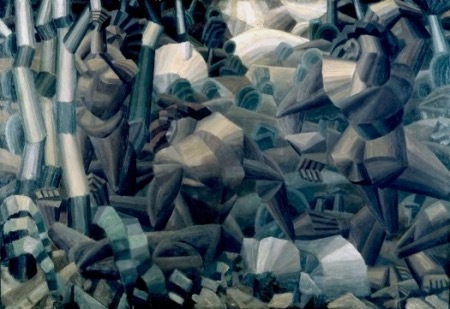 Léger sees in this the possibility of realizing his humanistic dream, where man, freed from his enslavement to machines, would find lost paradise and nature, and become complete again. Free the popular masses, give them a chance to think, even to cultivate themselves, and we will be at peace, they will in turn fully enjoy the plastic novelties that modern art offers. 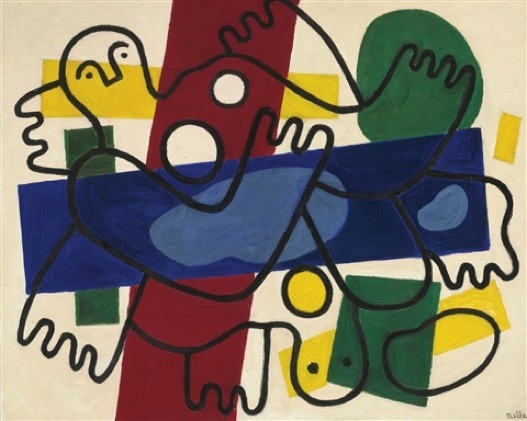 In March of 1940, Composition aux deux perroquets (Center Georges-Pompidou, Paris) is exhibited at the Galerie Mai in Paris, and then loaned to the Museum of Modern Art, in New York. Bad taste, strong color can fully use their power here… if I had only seen tastefully dressed girls, I would not have painted my Cyclists series. The American period is particularly creative. 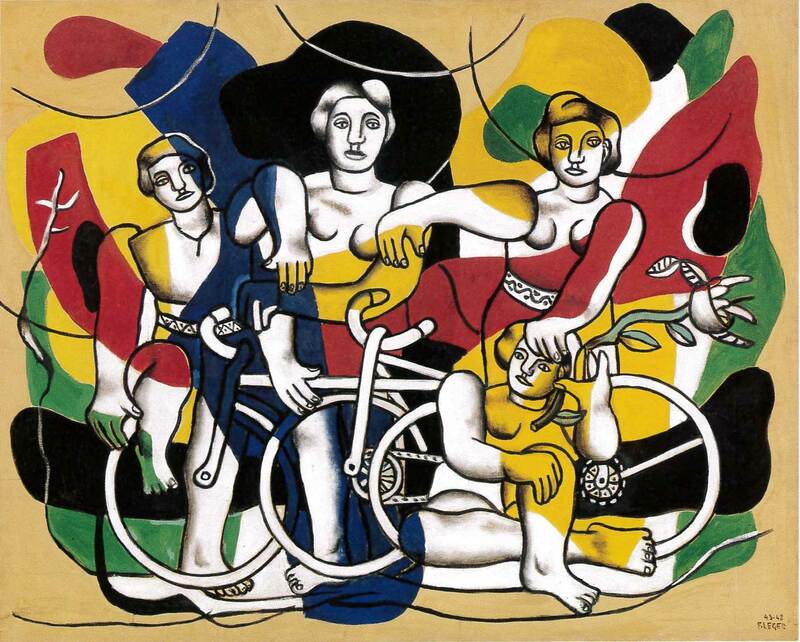 With the Divers and Cyclists series, Léger invents the principle of outside color, where he dissociates shapes and colors. 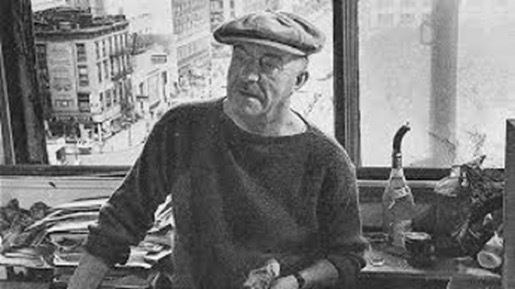 In 1941, he sets up his studio in New York, at 80 West 40th Street. He finds exiled friends, such as composer Darius Milhaud and some painters gathered Pierre Matisse’s gallery. In June, he travels across the United States by coach and joins André Maurois and Darius Milhaud at the Mills College to teach during the summer semester under the sign of France. In 1943, he produces a monumental copy of the Divers for the home of Rockefeller’s architect, Wallace K. Harrison, in Long Island. In the summer, he moves to Rouses Point near Lake Champlain, where he starts working on the American Landscape series. Even though during that period Léger paints abundantly and participates in numerous exhibitions and lectures, the exile is difficult. He has doubts and he is homesick. The ambiance among the French exiles is further disturbed by political conflicts. In Paris, he paints Adieu New York. His adherence to the French Communist Party is a real break: in this time of McCarthyism, it prevents him from ever obtaining another visa. He will never again set foot on the island of Manhattan. 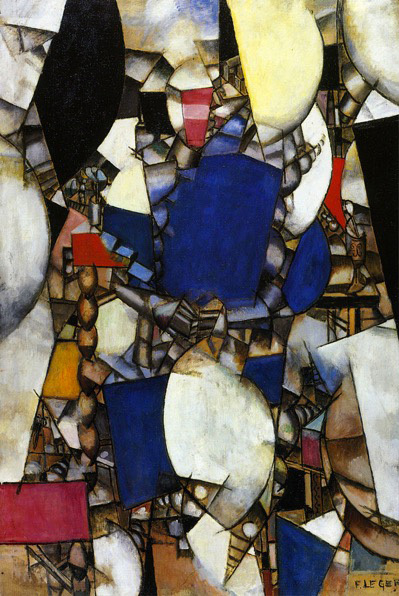 Léger has had a powerful influence on American art. 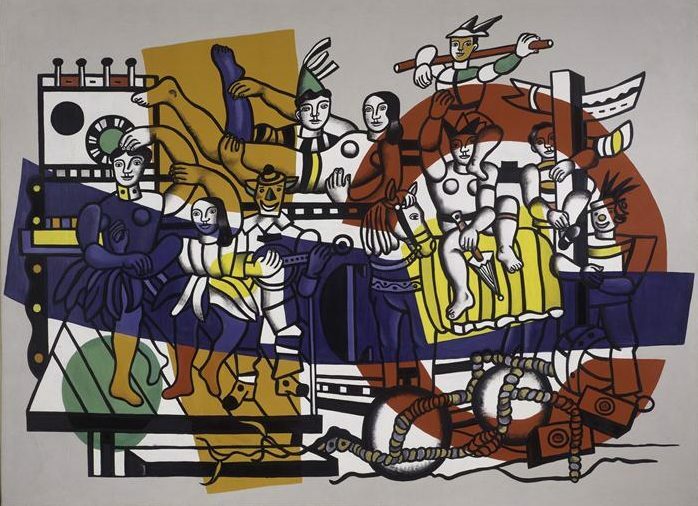 Renowned representatives of the American pop art generation like Roy Lichtenstein (1923-1997), Ellsworth Kelly (1923-), Robert Rauschenberg (1925-), Andy Warhol (1928-1987), and Jasper Johns (1930-) referred directly to Léger or elaborated concepts with European bases that had been largely established by the French artist. At a new location, 104 Boulevard de Clichy, his academy receives many GIs. Upon his return from the United States, Léger comes in contact with the publishing company Tériade who wants to work on a book with him. 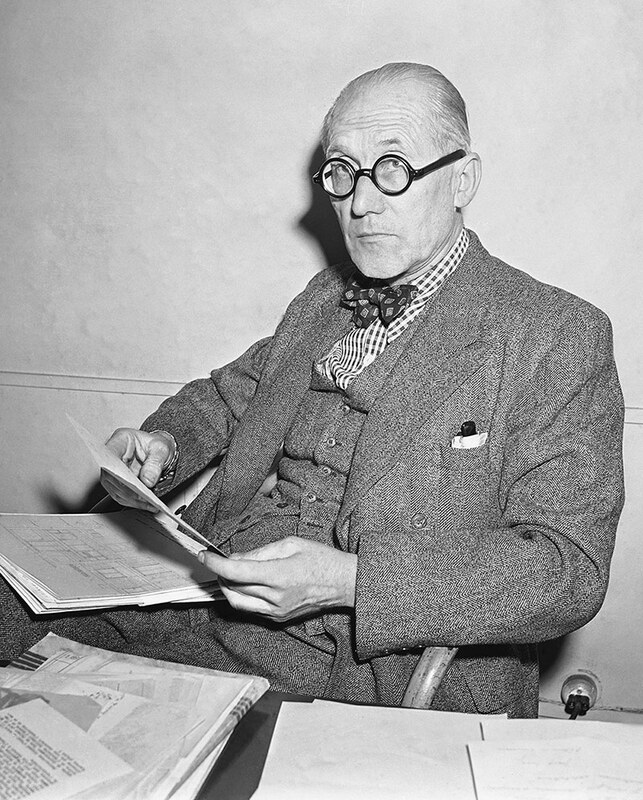 He accepts a project on the theme of the circus (1947). At first Léger wants to illustrate a text by Henri Miller, whom he met in the United States, but, disappointed with the text, he decides to write one himself (as is the case for the circus of Rouault and Chagall). In the book, Léger demonstrates a great freedom, using themes that are dear to his heart and masterfully writing in very spontaneous ways. The book is published in 1950. JI have always dreamed of large wall surfaces, whether it is school wall or a church wall. Dedicated to leisure and paid holidays, it elevates to the status of art the major social event that was the historic law voted under the Front Populaire. After the dark hours of the war emerges a joyful atmosphere, inviting people to enjoy the simple pleasures of resting in nature. I wanted to mark a return to simplicity with art that was direct, comprehensible to everyone, without subtlety. I think that it is the future, and I would like to see young people take that path. 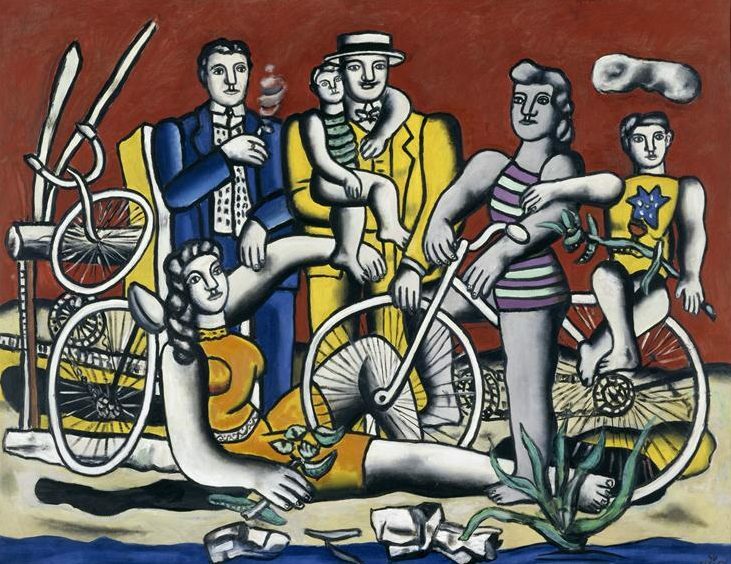 Readable and accessible to all, these “popular” works will make Fernand Léger the father of pop art and also an artist who will have known, until the last years of his life, to be ahead of his time. In February of 1952, he marries Nadia Khodossievitch and moves to Gros-Tilleul, in Gif-sur-Yvette (Essonne). He designs decorations for the General Assembly Hall of the Headquarters of the United Nations, in New York. In 1955, he receives the Grand Prix at the São Paulo Biennial. In July, he buys a property in Biot, named Mas Saint-André. He dies on August 17th at Gif-sur-Yvette, where he is buried on August 20th. 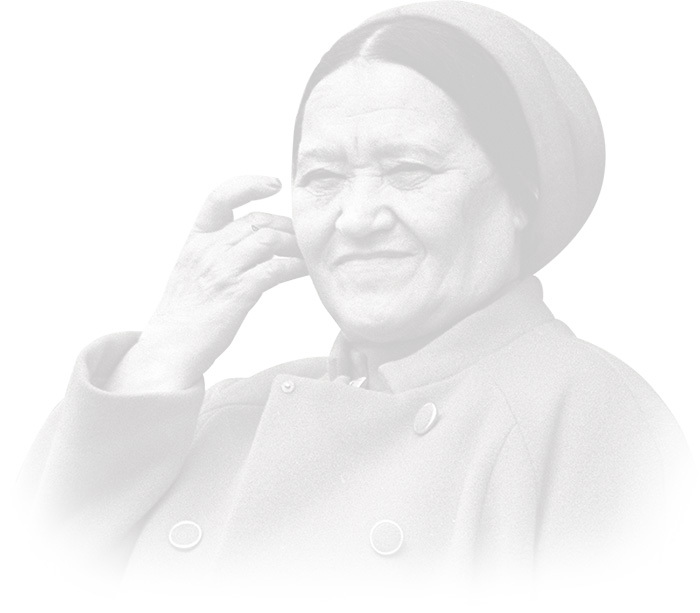 Nadia, true to Fernand’s wishes, will build in 1960 the museum we know today on the site of the Mas Saint-André. On the occasion of the donation to the French state – Nadia having always kept her Russian citizenship – the museum is inaugurated by André Malraux on February 4th, 1969. In 1970, Nadia transforms the Lisores farm into a museum.